Ideas and Movements That Shaped America: From the Bill of Rights to "Occupy Wall Street"
Editors: Green, Michael S. and Stabler, Scott L.
Presenting accessibly written information for general audiences as well as students and researchers, this work examines the evolution of American society and thought from the nation's beginnings to the twenty-first century. 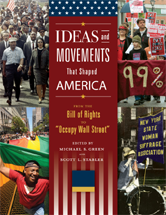 It covers the seminal ideas and social movements that define who we are as Americans-from the ideas that underpin the Bill of Rights to slavery, the Civil Rights movement, and the idea of gay rights-even if U.S. citizens often strongly disagree on these topics. The set's unique perspective serves to depict how American society has evolved from the nation's beginnings to the present, revealing how Americans as a people have acted and responded to key ideas and movements.